"You can't screw up so majorly that your badassery disappears. It is who you are. It's who you always will be. It's not up for negotiation." "Getting clear about what your unique purpose is can be the difference between living a happy, fulfilled life of abundance, choice, and expansiveness or living in the restrictive veal pen of your own indecision and tired old excuses." When you tap into your purpose and go at it full force, you are bringing beauty into the world. When you hold back and let fear and naysayers get the best of you, you are being selfish. People will no doubt freak out when you tell them your big plan. In their defense, they are looking out for your best interests (as best as they know how). And yes, it won’t always be easy. In fact, it may seem as if all odds are against you. However, Sincero reminds us that “Instead of taking this as a sign that you shouldn’t have [made that decision to follow your dream], take it to mean that you’re ridding yourself of your BS and moving in the right direction”. Sincero calls BS the “Big Snooze”. The BS will do anything to stop you from stepping into your new identity. It will do anything to stop you from growing and changing beyond the person that everyone one is used to. So instead of crawling back into our shells when something happens that is against our plans, remember the WHY in our decisions and actions to be greater. Remember that it is better to live your purpose than to live a life of misery and regret. Decide today to step into your badassery and own it! "Be grateful for all you are and all that you're becoming." In order for us to tap into our true selves – our badassery – we must love ourselves. We must be grateful for everything about who we are, even those things that we don’t tend to care for. Appreciate how special you are – No one can do it like you! Even someone with the same talent or gift as you will never be able to deliver it exactly like you. It’s your uniqueness that will draw people to you like no other. Drown yourself in affirmations – Instead of filling your mind with negativity, fill it with positive words and sentences (i.e. : I am enough, I am beautiful, I deserve happiness). Do things you love – Take care of yourself. You might as well enjoy the life that you’re living. Don’t think of it as being selfish. Remember, you can’t fill someone else’s cup from an empty cup. Find a replacement – Notice your thought patterns and behaviors and replace any negative ones with positive thoughts and behaviors. Ditch the self-deprecating humor – Self-explanatory. Let the love in – When someone compliments you, accept it and just say, “Thank you”. Don’t compare yourself to others – Just don’t. Forgive yourself – Guilt, shame, and self-criticism are destructive; forgive yourself so you can move on. Start believing that you CAN do it. Start believing that you CAN achieve your wildest dreams. Put your energy and focus on the ability to achieve versus the inability to do so. Whatever thoughts you give energy to is where energy will go and will in turn manifest itself. So, why not manifest what you want instead of what you don’t want. “The moment you have the audacity to start believing in the not-yet seen, your reality will begin to shift,” Sincero writes. Don’t worry about how something is going to happen. Don’t worry about where the money is going to come from. Don’t worry about who is going to give you that chance. Just know what it is that you want, imagine yourself already having it (or being it or doing it), and believe that it WILL happen. You Are a Badass reminded me to stop doubting my greatness. It reminded me of all of the things that have held me back from being the best version of myself. I can definitely see using this book as a reference as I coach clients. Are you ready to love yourself? Are you ready to shift your reality? 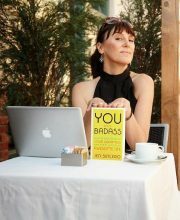 Are you ready to be the badass you are meant to be?